This documents describes the Basic Unit Testing assignment. Now navigate to the copy of AngularJasmine in your repository. Don't use the one in my repository! If you are using WebStorm, right click on test/index.html. Select Run. To run the application, at the bash shell type npm start. In Cloud9 choose "Preview running application." These include calls to beforeEach() and afterEach(). Those methods are called before and after each test. These tests are designed to prove that our tests are working and that we can access our Controller. In and of themselves, they are not particularly useful. 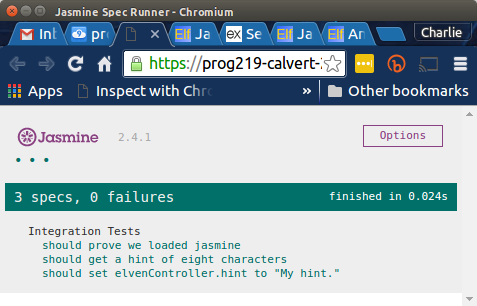 Note that in bower.json we use Jasmine 2.4.1. Create methods in your controller called square and add. They first should square a single parameter passed into it, the second should add the two parameters passed into it. Create a function called square that takes one parameter. Pass in the number 5. Create a function called add, pass in two parameters: 3 and 2. Make sure you have saved your work in the proper folder of your repository. Submit your work and include a note stating the folder where you saved your work, particularly if it differs from the default value specified in this paragraph. In bin/www we set the port to 30025. In package.json we use nodemon in the start property of the scripts object. First create .bowerrc and bower.json. To do so, make sure you have the most recent copy of JsObjects by running git pull at the root of the JsObjects folder.